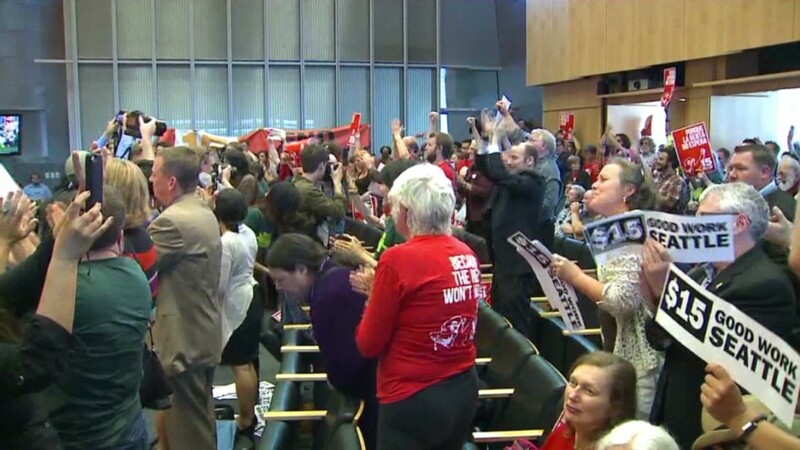 Seattle's city council on Monday unanimously approved an increase in the city's minimum wage to $15 an hour, making it the nation's highest by far. The increase was formally proposed by Seattle Mayor Ed Murray, and his spokesman said he intends to sign the ordinance on Tuesday. Washington already has the nation's highest state-level minimum wage, at $9.32. That rate also applies to the city. The current federal minimum wage is $7.25, and Democrats in Congress have been pushing for a gradual increase to $10.10, but so far to little effect. The increase to $15 in Seattle will take place over several years based on a scale that considers the size of and benefits offered by an employer. It will apply first to many large businesses in 2017 and then to all businesses by 2021. The first increase, on April 1, 2015, brings the minimum wage to $10 for some businesses and $11 for others. The advocacy group 15 for Seattle estimates the wage hike will benefit more than 100,000 workers. Related: What is the minimum wage in your state? Murray, a Democrat, pitched his plan as a compromise between supporters of a more immediate wage hike and concerned business owners. It was crafted by a panel that he appointed, which included both business and labor leaders. Some think the law does not go far enough. Those critics say the plan takes too long to phase in and object to an amendment that would let businesses pay teenagers a "subminimum training wage" for their first 90 days on the job. Other objections come from franchisees, who under the law are classified as large businesses and must raise their minimum wage before small businesses. The International Franchise Association announced it would file a lawsuit against the city claiming discrimination. Meanwhile, several states have passed or are considering proposals to adopt a $10.10 an hour minimum wage. Most recently, Michigan raised its hourly minimum to $9.25.